A new district in Kansas City, Missouri, hopes to bring new life into a neighborhood while rejuvenating the city’s job market. KANSAS CITY, Mo. — A new district in Kansas City, Missouri, hopes to bring new life into a neighborhood while rejuvenating the city’s job market. The Keystone District will be sandwiched between the historic 18th and Vine District and the Crossroads. 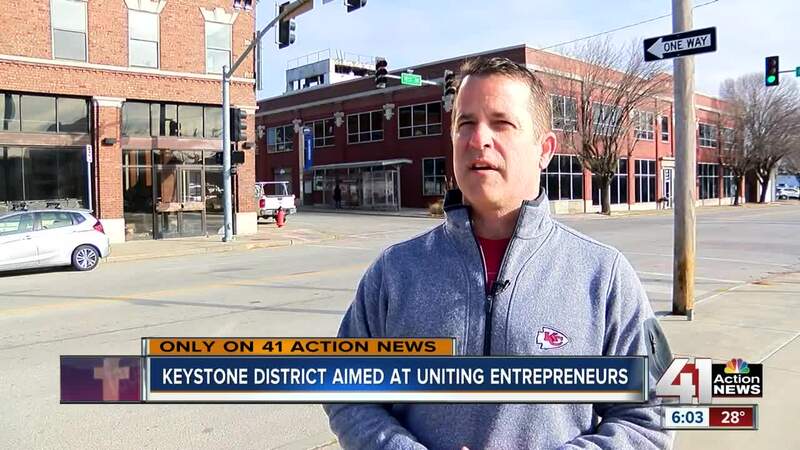 The creator of the Keystone District, Kevin McGinnis, said that he wants to create an innovation hub similar to ones found in St. Louis and Indianapolis. “What Kansas City lacks is a destination for this type of activity,” McGinnis said. He envisions a place where entrepreneurs, corporate innovators and students can all collaborate in one area. “There's a need for us to bring some of those pieces together to really provide that catalyst for innovation,” McGinnis said. McGinnis said he believes that creative influence from the surrounding districts will enhance the Keystone District. “Really provides that creative barbell that we think is going to be a huge force in driving innovation in the area,” McGinnis said. The city agreed to a three-year, $900,000 partnership with Keystone Community Corporation for planning and designing the district. According to McGinnis, the district will be a mix of new buildings and existing buildings that will be refurbished. He said the district will create opportunities for entrepreneurs through co-working spaces and by allowing universities — including the University of Missouri - Kansas City, the University of Kansas and the University of Missouri — to be a major part of it. “Anything that we do to improve the environment for entrepreneurship and create wonderful new places for people to connect and grow that will help our community drive the talent that we need,” said Maria Meyers, executive director of UMKC’s Innovation Center. UMKC student Salem Habte said the new district could be a benefit for aspiring entrepreneurs. “I think a connection like that would be really beneficial for the city,” Habte said. The innovation district could entice more students like Habte to stay in Kansas City, rather than moving to other cities with similar districts. “I would love to stay here for a period of time after I graduate," Habte said. McGinnis said he believes that the new Keystone District will spur more investment and development in that part of the city. “You should see an increased tax base, you should see an increase in population. These innovation districts are truly catalysts for economic growth that happens around them, not just the innovation district itself, but they really become a magnet for other business to join,” McGinnis said. Through the beginning of 2019, McGinnis will meet with stakeholders, including the universities, to go over the plan for the district. It could take more than a decade for the district to be completed.